Ask anyone: they’ll tell you I love paper books. This is just one wall of my office. And I don’t have an e-reader yet. The biggest reason for me is that I do 90% of my reading with library books. (I’ve just started counting up the books I read this year, and the number is going to be well into the multiple hundreds–which, realistically, would break any budget I might make, if I bought them all. 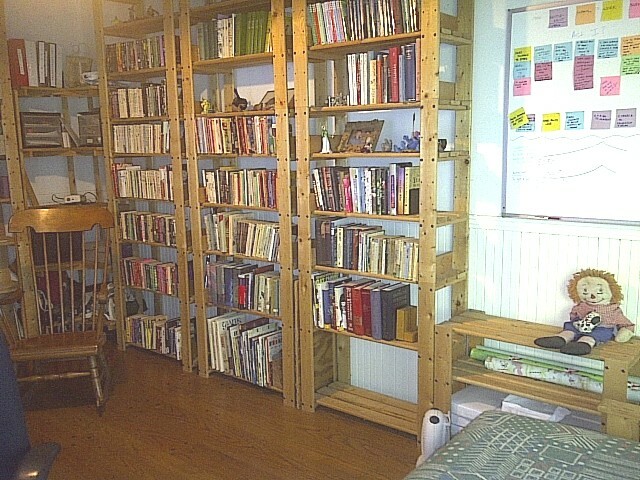 Plus look back at that picture of my office: not so much empty space for new books. I am a big re-reader. But…checking out books on e-readers is now possible, and my librarian assures me that their e-book selection will be growing substantially. Guess what I’ll be getting for my birthday this summer? Here’s one of the big reasons I’m going over to the e-reader side soon. My son bought himself a Kindle Fire in December. He loves it. I love it. And I realized, when I bought him Neal Stephenson’s REAMDE last month, that my husband is going to need a Fire at some point, because if I’m buying 1,000 page sci-fi books that they’re both going to want to read, I’m buying ONE copy, and they’re going to loan it, cross-platform, back and forth. Kids and E-readers. Remember, I’m always late to the game, so if you’re expecting some fresh, new revelations here, keep moving. All you’re getting are my thoughts. I am a big fan of kids and e-readers. Emotionally, I’m right there with all of you who want kids to love the feel of a physical book in their hand, who want kids to be happiest surrounded by the smell of paper and ink (and dust, if you’re in a used bookstore! ), who want them to know what it feels like to turn a real page and find out what happens to Anne and Diana after they drink the cordial. Unemotionally, though, I have to say…why? My son was an early reader, starting with the choking noises and the frustrated “Mom!!!!! !” in the Calvin and Hobbes books and moving quickly onto chapter books and longer stories. He was born in 1996, so of course he started with paper books (It’s actually hard for me to even buy a board book! ), and, yes, he loves them. 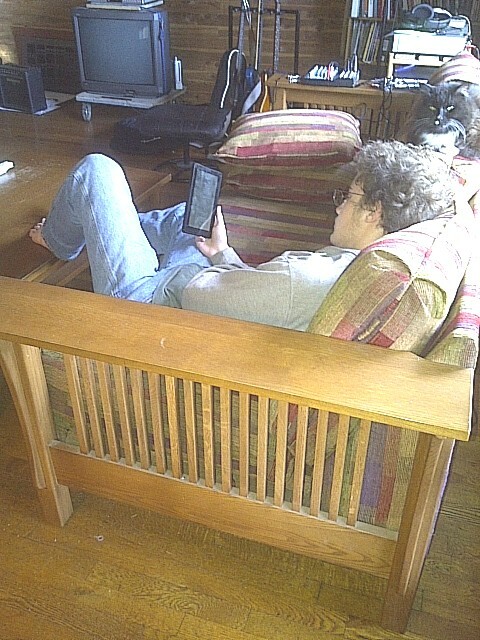 But take a look at that photo of him with his Kindle–is it really any less wonderful to see him (and the cat!) curling up with an e-reader than it would be with that incredibly thick paper copy of REAMDE? No, it isn’t. I know there are kids who don’t fall in love with books as early as my son did. I spent several years volunteering in his elementary school, on the reading side of things whenever I could, and I watched kids struggling with their reading, not to mention struggling with the humiliation and anger they felt for not reading as fast as the other kids, for not yet being out of those numbered, beginning-reader books. Guess what: humiliation and anger do not foster a love of reading. Do you know how much happier some of these kids would have been if they could have sat at their desk with one of these books on an e-reader, where the other kids couldn’t see what they were reading? Where their “level” wasn’t on public display, to add to their frustration? If these kids discover reading on an electronic device–and, yes, many do–why would we ever tell them NOT TO. Side note: why would we EVER cut library funding when, for some kids, this is the only place they’re going to have the opportunity to read electronically?! But e-books for kids are here. And more are coming. I may not have my own e-book reader yet. But I am so, already, on the bandwagon. Yay! I resisted getting a Kindle for the longest time and now love it. You make a good point about e-readers sparing reluctant readers embarrassment and humiliation. Wholly agree — that the important thing is for kids to read — doesn’t matter what or whether it’s a physical book or an electronic one. Words will never go away. Stories will never go away. We all have to be open to the changes which are inevitable. Personally, I don’t have room for any more bookcases, so the storage issue is also a big plus. We have a LITTLE more room for books, but I honestly don’t think I’ll have any problem filling that up, even with an e-reader. And last night I was thinking about ordering a research book I might need for a project with a quick turn-around: our libraries & local bookstores don’t have it. Guess how much faster I can get it here in e-form than in print form?! One more reason. Your post made me smile. A couple of years ago I said I’d probably never buy an e-reader. Ha! I am now the happy owner of a Kindle Touch 3G because we travel a lot and I love having this little “thing” that I can slip in my purse and whip out when there’s a break in the action. Plus, I get to choose! If I don’t feel like fiction, I read non. I can shop the store to see what’s new or read the latest reviews on a favorite author’s books. It just makes me happy. Plus, there will be no more schlepping pounds and pounds of books on vacations and trips. I also agree that e-readers can be wonderful tools for children’s literacy. Love the pic of your son.